Sheedy was born in New York City and has two siblings, brother Patrick and sister Meghan. Her mother, Charlotte (née Baum), is a writer and press agent who was involved in women's and civil rights movements, and her father, John J. Sheedy, Jr., is a Manhattan advertising executive. Sheedy's mother is Jewish, whereas her father is of Irish Catholic background. Her maternal grandmother was from Odessa, Ukraine. Her parents divorced in 1971. Sheedy attended Columbia Grammar & Preparatory School in New York City, graduating in 1980. She started dancing with the American Ballet Theatre at age six and was planning to make it a full-time career. However, she gave up dance in favor of acting full-time, then she started studying acting with acting teacher Harold Guskin. At age 12 she wrote a book, She Was Nice to Mice; the book was published by McGraw-Hill Education and became a best-seller. [dead link] On June 19, 1975, she appeared on the game show To Tell the Truth. Sheedy started acting in local stage productions as a teenager. After appearing in several television films in 1981, as well as three episodes of the television series Hill Street Blues, she made her feature film debut in Bad Boys (1983), starring Sean Penn, where she played Penn's humiliated girlfriend. The 1980s were her most active period, with roles in popular films such as WarGames, The Breakfast Club, St. Elmo's Fire, Short Circuit, and Maid to Order. Sheedy starred alongside Radha Mitchell in the 1998 independent film High Art, about a romance between two women and the power of art. Her performance in High Art was recognized with awards from the Independent Spirit Awards, Los Angeles Film Critics Association, and National Society of Film Critics. In 1999, Sheedy took over the lead role in the off-Broadway production of the musical Hedwig and the Angry Inch. She was the first female to play the part of the genderqueer Hedwig, but her run ended early amid "mixed" reviews, according to E! News. That same year, she was cast as a lead actress in Sugar Town, an independent film, which featured an ensemble cast of actors and musicians. She was reunited with Breakfast Club co-star Anthony Michael Hall when she became a special guest star on his television show The Dead Zone, in the second-season episode "Playing God," from 2003. Sheedy has also appeared in the episode "Leapin' Lizards" of C.S.I. in which she played a woman who murdered her boyfriend's wife while mixed up in a cult. On March 3, 2008, Sheedy was introduced as the character Sarah, in the ABC Family show Kyle XY. In 2009, she played the role of Mr. Yang on the USA Network television show Psych (in the third season finale), a role that she reprised in the fourth season, fifth season, and seventh season finales. Sheedy dated Bon Jovi guitarist Richie Sambora for less than a year in the 1980s. She stated in The Los Angeles Times that the relationship led her to abuse drugs, a claim Sambora denied. In 1985, Sheedy was admitted to Hazelden Foundation and in the 1990s was treated for a sleeping pill addiction, an experience which she drew on for her role as a drug-addicted photographer in High Art. On April 12, 1992, Sheedy married actor David Lansbury, the nephew of actress Angela Lansbury and son of Edgar Lansbury, the original producer of Godspell. They have had one child, who was born a female in 1994, but now identifies as a man and goes by the name Beckett. Because of this, Sheedy is a strong supporter of transgender advocacy. In May 2008, Sheedy announced that she and Lansbury had filed for divorce. In January 2018, Sheedy tweeted the #MeToo hashtag along with the names of James Franco and Christian Slater, indicating that they have been sexually inappropriate with her and that Franco was the reason she chose to leave show business. She later took down the tweets. When asked by Seth Meyers, Franco stated that he did not know why Sheedy would have tweeted those accusations. 1994 Red Shoe Diaries 4: Auto Erotica Karen Video; segment: "The Fling"
1981 CBS Afternoon Playhouse Cathy Episode: "I Think I'm Having a Baby"
1982 Chicago Story Episode: "Bright Lights, Big City"
1982 St. Elsewhere Diane Episode: "Samuels and the Kid"
1992 Red Shoe Diaries Karen Episode: "Accidents Happen"
1993 The Hidden Room Julia Episode: "Hungry Girls"
1996 The Outer Limits Carter Jones Episode: "I Hear You Calling"
2001 Oz Lisa Logan Episode: "Medium Rare"
2001 Strange Frequency Lee Bonner Episode: "Daydream Believer"
2002 Once and Again Miriam Rose Miller Episode: "Aaron's List of Dreams"
2003 The Dead Zone Kate Moore Episode: "Playing God"
2007 CSI: Crime Scene Investigation Shannon Turner Episode: "Leapin' Lizards"
^ "Today in history". The New York Times. Associated Press. June 13, 2014. Archived from the original on September 7, 2014. Retrieved June 14, 2014. ^ Independent, Film. "Film Independent Spirit Awards: 31 Years of Nominees and Winners" (PDF). filmindependent.org. filmindependent.org. Retrieved 24 January 2017. ^ a b Robledo, S. Jhoanna (September 13, 2009). "Brat Packer Packs Up". New York Magazine. New York City: New York Media. Retrieved September 15, 2009. ^ Leibovich, Lori (June 26, 1998). "Heroine Chic". Salon Magazine. San Francisco, California: Salon Media Group. Retrieved October 6, 2018. ^ "WEDDINGS; Marilyn Webb, John Sheedy Jr". The New York Times. New York City: New York Times Company. March 21, 1993. Retrieved April 23, 2010. 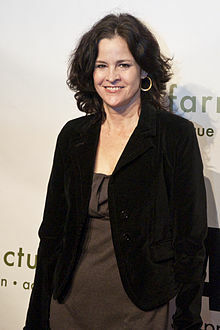 ^ "Ally Sheedy Biography (1962–)". ^ Collins, Glenn (May 27, 1991). "Celebrating a Place Where for So Many The Good Life Began". The New York Times. Retrieved April 23, 2010. ^ Sohn, Amy (2011). "Musicians, Mensches, and Muff-Diving: Ally Sheedy by Amy Sohn". Retrieved May 21, 2011. ^ Rochlin, Margy (June 14, 1998). "Ally Sheedy Makes a Bid To Be Taken Seriously". The New York Times. New York City: New York Times Company. Retrieved September 2, 2012. ^ a b Dretzka, Gary (June 28, 1998). "Back from the edge, Ally Sheedy may be on the verge of another breakthrough". Chicago Tribune. Chicago, Illinois: Tronc. Retrieved December 3, 2010. ^ Neumaier, Joe (2010-07-17). "New York native Ally Sheedy never strays far from the Upper West Side". nydailynews.com. Retrieved 2019-03-26. ^ "A Young Ally Sheedy on 'To Tell the Truth' in 1975". The Retroist. July 15, 2013. Retrieved October 6, 2018. ^ Ebert, Roger (July 3, 1998). "High Art Movie Review & Film Summary (1998)". Chicago Sun-Times. Chicago, Illinois: Sun-Times Media Group. Retrieved January 15, 2017 – via rogerebert.com. ^ Keller, Julie (December 17, 1999). "Ally Sheedy Inches Away from "Hedwig"". E! Online. Los Angeles, California: NBCUniversal Cable Entertainment Group. Retrieved October 6, 2018. ^ Thomas, Kevin (September 17, 1999). "Down and Out in 'Sugar Town' After Fame Has Fled". Los Angeles Times. Los Angeles, California: Tronc. Retrieved January 15, 2017. ^ "Season 2 Overview". The Dead Zone Official Website. Retrieved August 10, 2010. ^ Natale, Richard (June 10, 1998). "On the Upswing". Los Angeles Times. Los Angeles, California: Tronc. Retrieved September 1, 2011. ^ Rochlin, Margy (June 14, 1998). "FILM; Ally Sheedy Makes a Bid To Be Taken Seriously". The New York Times. New York City: New York Times Company. Retrieved June 30, 2010. ^ Winters, Laura (June 21, 1998). "Ally Sheedy, Leaver of the Pack". The Washington Post. Washington DC: Nash Holdings LLC. Retrieved October 6, 2018. ^ Pieklo, Jessica; Gandi, Imani (November 2, 2017). "Boom! Lawyered: Beckett Lansbury and Ally Sheedy on How to Be a Better Ally to Trans People". Rewire.com. Retrieved November 7, 2017. ^ Yahr, Emily (January 11, 2018). "Seth Meyers presses James Franco on why he hasn't contacted Ally Sheedy about her tweets". Washington Post. Washington DC: Nash Holdings LLC. Retrieved October 6, 2018. ^ Robinson, Joanna (January 7, 2018). "Why Did Ally Sheedy Call out Golden Globe Winner James Franco on Twitter?". Vanity Fair. New York City: Condé Nast. Retrieved October 6, 2018.